I showed houses this past weekend to two separate families in two separate price ranges. Both families are working from two separate wants/needs lists, both have different limits and constraints. And . 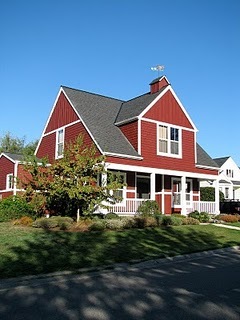 . . even in a time of year with a lean inventory (166 homes on the market), there are still a lot of homes to look at . . . a lot to choose from. One family found a home this weekend, one is still looking. So . . . I have seen this scenario several times now, the list, the wants, the pros and cons with houses and buyers. What makes this house . . . THE house? What strange brew of factors makes the heart beat faster . . . what ingredients must a house possess to give off the right vibe, the good vibe, the vibe that makes it a home, not just a house. The home may not be the floorplan the buyer was looking for or the size, or the price . . . but that feeling, that emotional reaction has made buyers put more pens to paper than any other nexus of wants or needs they might be searching for. Is it the decorating? Is it the light? Is it the smell? Is it the quality construction? Yes, sometimes. But other times, no. The vibe, quite frankly, is hard to define. We sold out house in CA in 2007, in a bad market. We had a what I considered an atypical house in that it was a large two bedroom, two bath house on a large lot. It was hard to price. For the eight years I lived there, I worried that it would be a tough sell because it was essentially set up as a family home, but only had two bedrooms. However, during those eight years, we put a lot of love and sweat into that house and made it quite charming, inviting, and comfortable. When the agents from my office came through my house I was exhausted and nervous. Nervous about the price we had listed the house at, nervous it would not sell, nervous it was not clean enough, etc. I had three other homes in escrow, my husband was already living in Seattle, it was my daughter’s birthday and I was fried emotionally. However, standing there in my living room, an agent I trusted turned around and said, quite frankly “this is a happy house, this will sell.” My heart fluttered. Somehow, despite the amount of stress billowing out of me and my family at that time, my house had given off the vibe. As the biased owner of the house, I could not be the one to detect it and it certainly was not going to give off that vibe to everyone, but the first weekend it hit the market we had three offers. Can You Can the Vibe? Yes, often it is hard for me to figure out exactly what my buyers are looking for. I listen (I really do) I think, I rehash their lists, I bore my husband with my real estate musings. Often times I think I have delivered up just what they ordered, only to get a flat, non-excited, nope, this-is-not-the-house-we-are-looking-for reaction. Conversely, more than once, we have pulled into a driveway of a house on our tour, last minute, because time permitted, a house that did not fit the wants and needs list. And yes, you guessed it, that look appears on their faces, that twinkle in their eye . . . I can tell the vibe is coursing through their bodies. The house on the busy corner, the house that is 500 square feet smaller than they said they would ever stand for, the house that is $30K more than they wanted to spend has the vibe. I have to remind myself that the vibe trumps the list every time. Once again. 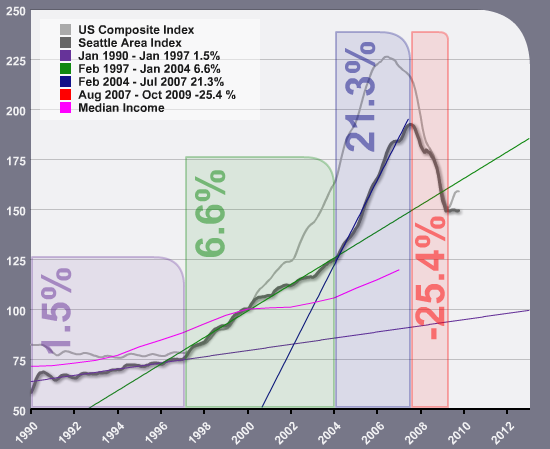 In October of 2008, I wrote a post looking at the history of housing prices in the Seattle area. Since my clients are still asking me to predict the future (should we buy now or wait??) – I thought it was important to update this data to see exactly what prices have been doing. So, we want to look at where this current drop will meet back, with the older, slower, saner, rate of increases. Since I last posted in October of 2008, prices continued to drop, and dropped at an average yearly rate of over 25% until the first quarter of 2009. Then as you can see with the dark grey line, prices have stabilized – they are jogging along at a steady pace. The light grey line in the US Housing Composite Index, and overall in the US, prices are going back up. In the last post I predicted a more steady decline, however, the unemployment rate and the economy as a whole took a blast in 2008, which I am sure explains the dramatic drop in the red bar. If Seattle follows the US, we could certainly head back up to the 6.6% rate of increase line and see an uptick in prices. Or, we could stabilize and head for a meeting with the median income, which seems like a logical prediction, since our economy and how people are viewing and spending money, has become just that, logical and now a little more predictable. Seattle’s median housing price ($321,500) is of course significantly higher than the US ($178,000), which I think explains whey we are not going up right now, we were already higher to being with. Current median price data from the National Association of Realtors. Yes, normal and stable would be great. All in all, I do believe that is what 2010 will serve up. So, is it a good time to buy? With the Expanded Housing Credit and amazingly low interest rates, my answer is yes. Those of us in real estate could really feel these numbers below as we closed up the year. 2009 was a different year than 2008. I am hoping for a “normal” market as we head into 2010. To look at the year end numbers very simply, if 2007 (332 sold) was very high in regards to number of sales and 2008 (187 sold) was very low, 2009 (212 sold) looks like it was the happy medium. Where the price per square foot is heading is the question everyone is asking. I am predicting stabilization, but I will analyze that topic further in an upcoming post. One of the original homes on Haley Loop, built by Cox Homes in 2001. One of the newer homes built by Chaffey in 2007. A newer custom home on Haley Loop built by Landmark Homes in 2006. A newer home on Ledgestone Loop built by Western Devco in 2008 . Another newer home on Haley Loop built by Landmark Homes in 2006, shows one of the over acre lots. The Stetson Ridge Neighborhood is a neighborhood of about 40 homes on the south-central portion of the island. The neighborhood is comprised of large, newer homes also on large lots. Homes sizes range from 3500 to over 5000 square feet and the lots range from .50 acres to over 1.25 acres. Set high upon the hill, some homes enjoy a Seattle city view or partial view. The first homes were built in 2000, the bulk being built in 2001 and 2002 by Landmark Homes. Chaffey Homes also developed two cul-de sacs in Stetson Ridge between 2001 and 2008. Another handful of custom homes were built by Western Devco in 2007 and 2008. Poor timing in the construction market returned three of the Western Devco homes to the bank and resulted in 2 bank sales in 2009. 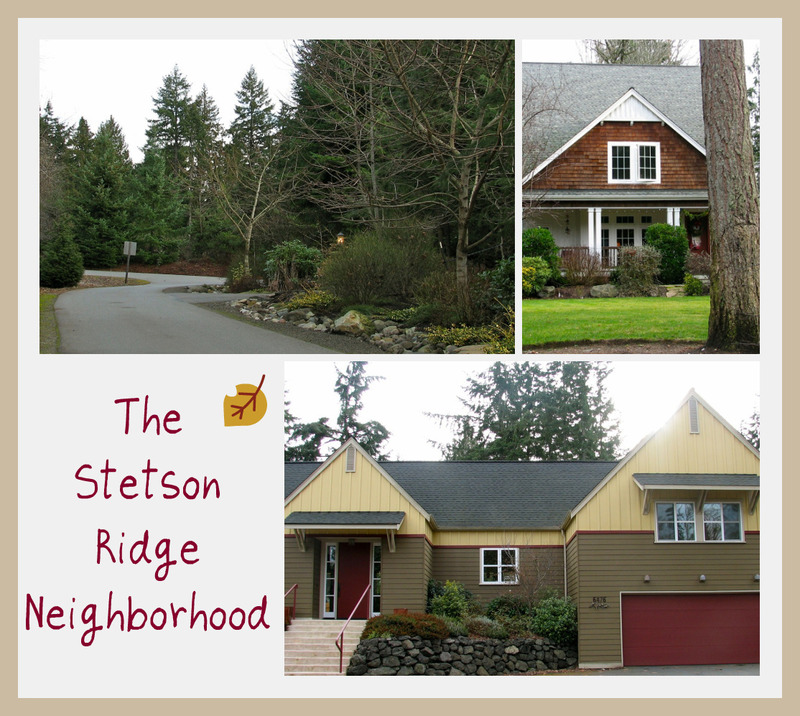 Stetson Ridge, since its inception, has been a popular neighborhood, because it is close to Winslow (the ferry) and you lave a large newer homes, on large lots, but you still have a neighborhood feel – you are not isolated on an acre in the woods. I am going to go a bit further in depth than I have in some of my other neighborhood posts, because the higher end market on the island has seen dramatic price reductions over the past three years – and since this is a neighborhood of high end homes, it is worth looking at further. In 2007, the price of entry into Stetson Ridge was right about a million dollars. As the market declined, the higher-end market here on the island was among the hardest hit. The new construction sitting unsold in Stetson Ridge in 2007 helped soften the market and then adding to that the bank sales this year – the result – prices have seen a substantial decline between 2007 and now. If you look below you’ll see that in 2007 you needed a million dollars to move into this neighborhood, but in 2009, no sales were over one million. The average price in Stetson Ridge has dropped 30% from 2007 to 2009, making entry into this great neighborhood much more affordable. There are a handful of homes for sale in the neighborhood, contact me if you’d like more information. 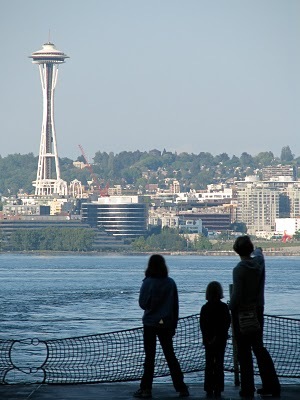 2009 is in the record books and on Bainbridge Island, in regards to real estate, it was a memorable year for many buyers. This past year many deals were had on new construction. Several homes that were built in 2007 or started in 2007, just as the market declined, finally sold this year. Builders got realistic and some major price adjustments were made and then the buyers jumped in. A prime example is the Old Creosote Hill home below. When it hit the market, the original price for this new home was $1,190,000 and we saw several price adjustments over the year and a half it was on the market, but when it hit $749,000 my buyers jumped . . . as did others, the house ended up having multiple offers. The price was right . . . and with most of my buyers this year getting 30 year loans for under 5%, the price was really right. The majority of my sales were with buyers this year, folks new to the island, and it was a positive, upbeat year representing buyers in this incredible buyer’s market. My list below runs the gamut from neighborhood homes to waterfront homes, these homes made my list for a variety of reasons which I will explain as we go . . . and you will hear the word value a lot. This one is all about a great price & a great location. Being in Commodore puts this home close to the ferry with a good floor plan, new deck, and large, level lot. My buyers acted fast and we wrote their offer the day this hit the market. And today, they still feel like they got a great value on this in-town home. This home went through an amazing renovation, which took it from a high quality Hillandale Home to something straight out of Southern Living Magazine. Grand woodwork and quality fixtures, coupled with guest space over the garage and a gorgeous backyard make this a like-new, in-town custom home, in a neighborhood, which is a hard combo to find. d paid a little over asking price for their very own private waterfront home. This is another great in-town package. A large (3109 sq ft) solid home with classic style, good floor plan and nice kitchen & baths. 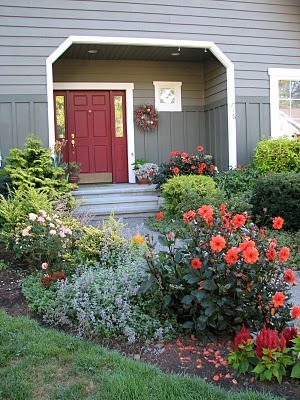 Add a beautiful backyard on the Wing Point Golf Course and close proximity to the ferry to this already charming home. This is a lot of home at a great price. This home sold for 1,260,000 in early 2008. Relocation forced this sale and the new buyer got an amazing newer home (2006) on a 1.2 acre lot with a partial city view in the Stetson Ridge Neighborhood at a $420,600 discount from 2008. I have already bragged, I mean blogged, about this home in an earlier post. My buyers snapped this up when the price hit $749,000. 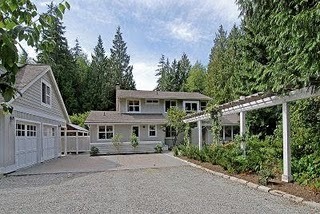 On a half acre, this spacious home (over 3500 sq ft) with amazing woodwork and views of Seattle & Eagle Harbor was the home in the woods my buyers were looking for. 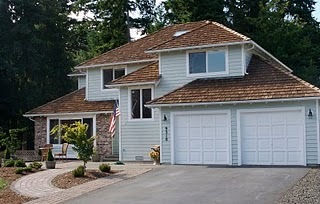 This new home was built by one of my favorite builders, Bainbridge Island Classic Homes. One of his homes made my list last year. The classic architecture, wood details, functional floor plan, huge chef’s kitchen, all in a home directly adjacent to Battlepoint Park put this one on my list. Another new, big beautiful home, this one built by Jefferson Fine Home Builders. This 4600 square foot home has fine details like painted wood cabinets and circular rooms. On a sunny south end lot with incredible windows and walking distance to Lynwood Center make this one a definite favorite. Another great package: Eagle Harbor waterfront, quality Cape Cod style craftsmanship, apartment over garage, close to town. This home has everything you need plus things you don’t really need like a gazebo, rock fire pit and a place for your kayaks. A view for under $600K. This is a 3000 square foot home that did not come out of a cookie cutter. I think of this one as a mini Kennedy Compound, crisp white home with a separate detached garage (unfinished potential space above), sitting on a .83 lot with a sweeping lawn , a terrace, a sport court and don’t forget the view. Quite a grand set-up on the sunny south end. A very lucky buyer acted fast and got a great value, in my humble opinion, one of the best this year. All photos by Jen Pells, with the exception of #1, courtesy of NWMLS. Sales data from NWMLS.